← The Flynn’s Beach resort is a tourist attraction in itself! Being a single parent pensioner made holidays difficult to afford until I became a Worldmark owner in 2006. But now with the cheap flights being offered on the east coast of Australia I took the opportunity for a random getaway to surprise my 12yr daughter. The flights were cheap as chips & Wyndham Kirra Beach was calling us away from the cold autumn weather of Sydney to sunny Queensland. The night before we were due to depart, I arranged with a friend (who lived closer to Sydney airport) for my daughter & I to visit overnight to allow for an early getaway to the airport in the morning. It also fitted well with my alibi that Aunty Liz had just had a birthday so this was a good excuse for us to visit & my daughter not to be suspicious of my motives. Because of the distance we live from the airport I told my daughter it would be too late & cold to come home that night & that we would sleep over & Liz would drop us at the station on her way to work the following day where we would return home & go to school a little late from there. The dinner & sleepover went well & after waking, showering & breakfast without a hitch, Liz dropped us at Kingsgrove railway station. The train was crowed & we had to stand. As the train departed International Airport station, headed for Domestic, I broke the news to my daughter that she wasn’t going to school that day. She asked where we were going. Trying to keep a straight poker face I simply replied “Somewhere special” She tried to guess by asking if we were going to have lunch with another friend who worked in the city. “No”, I replied holding my solemn face. As the train arrived at domestic & we alighted, heading for the escalator, I told her we were going to the beach. I am sure she expected that the top of the escalator would reveal sunny sandy shores. Instead she found the a long corridor of baggage claim roundabouts. “Are we going on a plane?” she asked after having worked out roughly where we were. Still struggling to hold my straight face, I mumbled “Maybe” The excitement in her eyes grew. “You don’t need a plane to go to the beach” She explained to me. “You do for the beach which I have in mind” I responded. Soon she was nagging me asking which beach we were going to. As we approached the check-in counter & the staff asked where we were off to, I could contain the secret no more. My daughter heard me say “Coolangatta” Her excitement exploded with the question “Are we going to the Theme Parks?” With disappointment I had to let her down slowly that unfortunately that did not fit in my budget for this trip. She didn’t seem to mind as we headed to Krispy Kremes for morning tea while awaiting the boarding call for our flight. As the call finally came to board the plane, I reminded her that it was NAPLAN testing day at school & that she would not be getting out of it, as I had printed practice sheets off for her to study on the flight & arranged for her to sit the tests later in the week. Still this didn’t dent her enthusiasm. After finding our seats & settling in, we soon were on our way. She barraged me with questions about what our day would contain. I really wasn’t sure what we would get up to as budget was tight. I just planned to follow our nose. After arriving at the airport we found our way to the local bus and boarded it, headed for Surfer’s Paradise. The bus dropped us right at Cavill Ave & outside the Wax Museum. It was decided that we would go there first. 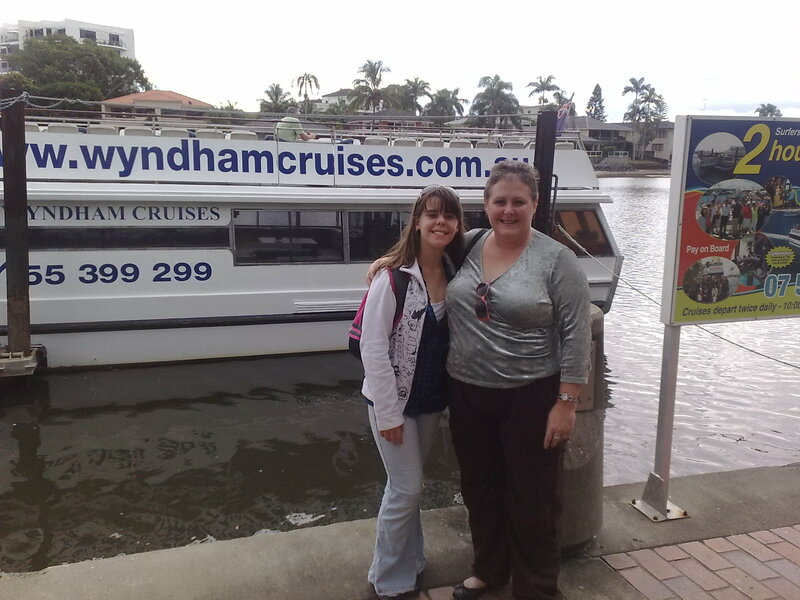 The staff were great and casual conversation upon our completion of the tour had suggested a waterways cruise of the rich & famous homes of the gold coast. Sounded a lovely way to spend the glorious afternoon sun of Surfers. The cruise incl devonshire tea & an open top deck area. Typical teenager, she had to brag to her school friends by sms since it was after 3pm. Rubbing in the NAPLAN testing & the warm weather, the enjoyment of the surprise shone on her face. After alighting from the completed cruise she asked if we could go to Ripley’s Believe it Or Not. I was getting short on cash but could probably juggle funds if we could find an Internet cafe to access online banking. It was about 5.30pm when we entered Ripley’s and the adrenalin was still running wild in her blood. Everything in there only excited her more. What a hyped but well behaved child she was when we emerged about 7pm. We found our way to a bus which would take us close by our hotel. As the bus drew closer to our stop the rain poured down heavily, & we wondered how we would get from bus stop to hotel without umbrellas. “Argh what the heck” I said to her as we alighted the bus, “Who cares if we get wet? We have a nice hot shower & warm beds waiting for us at the hotel & our wet clothes could be thrown in the clothes dryer.” We made a run for it. Laughing about it all as we entered the hotel lobby, we checked in and found our way upstairs. While I cooked dinner, she took a shower & we had a TV each to retire to once we were warm. The following day we planned to hit the beach. One of few things that would not impose on our already battered budget. We had a leisurely walk and as we headed back to the hotel pool, we noticed a guy setting up to receive a skydiver on the sand. We stayed & watched in amazement. I had even tried to video tape it. We strolled to the hotel’s pool and while my daughter swam I tried to review the video on my mobile phone. Oh no, I had forgotten to open the shutter so had all the sound and no visuals. Oh well, the image was embedded in my memory. After a quick dip in the pool we showered & packed our stuff, ready to head to the airport for our 1.30pm flight. Beginning to finally come down from the excitement we walked to the airport & grabbed a bite of lunch at Subway before checking in & waiting to board our flight home. Most of the flight home was spent with closed eyes resting from the whirlwind adventure we had enjoyed sharing. We still had an hour train journey & half hour bus ride from the airport to home but that was OK, nothing would replace the enjoyment I dwelled in from the look on my daughter’s face, firstly at Domestic train station, but also throughout the whole 48hrs since leaving home. It was worth more than any amount of words can describe. Thank you Wyndham for allowing me to chisel such enjoyable bonding times in the childhood memories of my daughter. This entry was posted in (QLD) Gold Coast and tagged australia, family, gold coast, Kirra Beach, queensland, resort, vacation ownership, worldmark, Wyndham Resorts. Bookmark the permalink. Karen I love your story and commend you for the effort you have made to give your daughter a magical memory. I hope you and Chloe will continue to enjoy special bonding trips together in the future and with the help of world mark resorts I guess you will! We must go there too, to have a well earned rest and relax for a while. Good one! You made a real surprise out of it – and what a lovely time for the two of you. Hard to beat the beach isn’t it?